And that is music’s role in our lives – to search out feelings in us which cannot be expressed in words alone. Oscar Wilde wrote: “music creates for one a past of which one has been ignorant and fills one with a sense of sorrows that have been hidden from one’s tears.” He suggested that music allows us to encounter things, and our emotional reactions to those things, that we didn’t even know about ourselves. 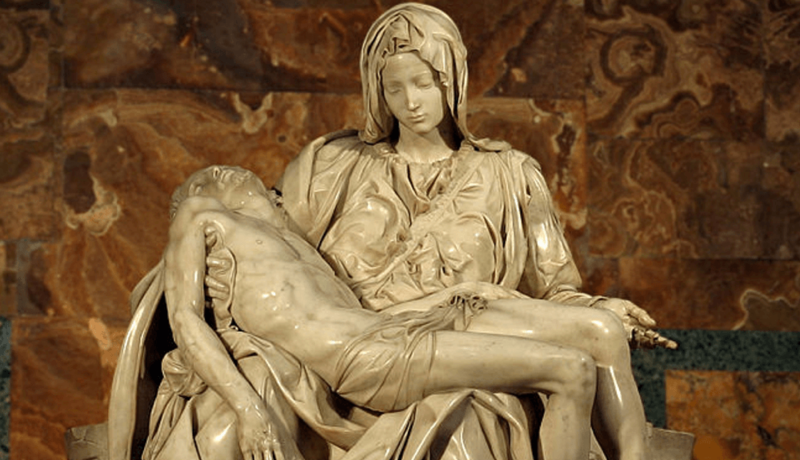 The first time I saw Michelangelo’s Pieta I was travelling alone, wandering through St. Peter’s in Rome, and quite unprepared when I turned a corner and came upon the grieving Mary. I burst into tears. Barber’s Adagio communicates pain as clearly as Michelangelo’s stone. With the reading of the Passion narrative moved to the end of the Palm Sunday service, there is a thread created which pulls us towards the Holy Week services of Maundy Thursday, Good Friday, and Holy Saturday, and connects us to those places of loss and pain that are not expressible in words. Pairing Barber’s music with the reading of the Passion, as we’ll do at St. John’s, will, I hope, help people hear the words in a new and deeper way, giving them access to feelings they have no words for. Perhaps hearing the narrative in a way which makes an Easter resurrection all the more possible. 6:30 pm at St. John’s Episcopal Church, Norwood Parish. Born out of wartime suffering in 1940, a Reformed Protestant from Switzerland, Brother Roger, founded a small community of men committed to a life of service and prayer among the poverty and fear of occupied France. He hoped the monks of this community would become “signs of the presence of Christ” and “bearers of joy.” In later years Catholics and Anglicans joined the Reformed members, and Taizé now lives into Brother Roger’s ecumenical vision in their home in the Burgundy region of France, and in their satellite communities around the world. Since the mid-1960’s the community of Taizé (pronounced teh-ZAY) has become a pilgrimage site for mostly young people, with nearly 100,000 visitors each year now. The music of Taizé sprang from a desire to welcome these pilgrims during worship with a simple form of chanted prayer which could reach across the many languages and religions represented by the pilgrims. Simple phrases and harmonies, repeated, sometimes in canon, became another way to pray and connect with God. As with chanting in any spiritual tradition, the sound of the human voice sends vibrations through the body, permeating all of our cells, becoming a practice which calms the mind and frees us to listen more closely for God’s voice. The chants can be sung in many languages, but are often set with words in Latin. As a language which belongs to no one, Latin can be a language which is available to everyone. Simply knowing that the words are holy, that they often come from the psalms or recall the life and works of Jesus, can be enough sometimes. Singing in Latin can take our focus off the text, allowing our voice to be more fully in communion with God’s voice. In the context of an evening service which is, in part, a commemoration of All Saints and All Souls, singing the contemplative chants of Taizé can sometimes take us to a place of darkness and grief. I hope you will allow the darkness of an evening service to create a feeling of being cocooned by God’s love. Like the healing power of sleep, change, growth, and beauty can emerge from the darkness of a cocoon. And perhaps there will be a moment during the singing when someone finds that they are drawn from their cocoon, into the radiant light of God’s healing touch. Find five minutes, if you can, to watch this video of photos and music from the Taizé community. Sit quietly, breathe, be present with God.